News release: CSEP is disappointed that the government has decided to stick with their proposed 5% welfare rate increase for people with disabilities or those fleeing abuse (S.45 clients) and 2% for everyone else. “We are also very disappointed that the SHR and the increases will not come into effect until January 2020” said Stella Lord. 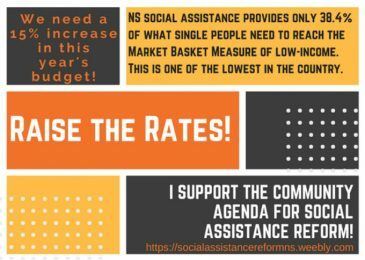 It is budget day in Nova Scotia, and a small group of income assistance recipients gathered in front of Province House to remind fellow Nova Scotians that life on income assistance is unlikely to get much easier as a result. 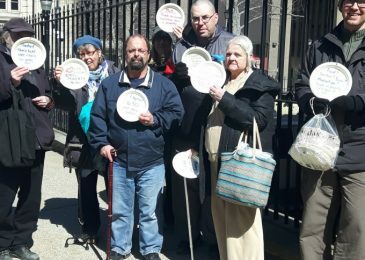 News release: On Budget Day, Tuesday March 26th at noon, outside of the legislature, members and supporters of the Benefits Reform Action Group will be gathering for an Empty Plate Luncheon. 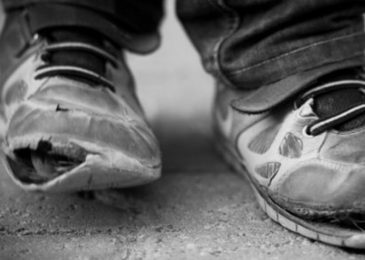 There are 155,000 people in Nova Scotia living below the poverty line (Market Basket Measure). The 250 plates that will be on display will each represent 650 Nova Scotians who cannot afford the basic goods needed to live in this province.